Stephen Karangizi, Director and Chief Executive Officer of the African Legal Support Facility on Monday said the facility offers the needed tools for African countries to better negotiate infrastructure investment deals. 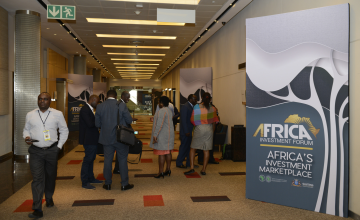 Karangizi made the comments at the Africa Investment Forum taking place in Johanesburg, South Africa. He also noted that the facility helps to create transparency between African governments, and private sector funders and providers of essential infrastructure. Created by the African Development Bank in 2010, the Facility supports governments in negotiating complex commercial transactions, providing legal and technical assistance in public-private partnership projects across the oil and gas, mining and energy sectors, and covering sovereign debt issues and creditor litigation. The Forum is taking place at the Sandton Convention Centre in Johannesburg from 7-9 November, 2018. Risk, or the perception of risk, is a major hurdle to attracting foreign direct investment in Africa. But now the African Development Bank's transaction-based Africa Investment Forum is helping to remove these barriers. Amid commercial new discoveries of oil and natural gas in Africa in the last few years, Dr Louis van Pletsen, Founding Partner of Quantum Power, says the main starting point for infrastructure is energy projects, because 600 million out of one billion Africans do not have electricity. Both Van Pletsen and Karangizi were speakers in a session entitled: Negotiating Win-Win deals. By ensuring that investor returns match capital outlays, van Pletsen told participants that the days of above 25% profits on projects are over. Investors need to find local partners, involve multilateral development agencies, and view energy projects across nations -- not country-by-country -- to achieve economies of scale. With South Africa producing 55,000 MW of sub-Saharan Africa's total generating capacity of about 80,000 MW, the relatively minor electricity needs of most African countries must be balanced against their ability to fund debt, he said. For Shaheen Ahmed, Managing Director of consultancy Energy System Planning, the African Legal Support Facility provides multi-disciplinary support on projects, including standardised documentation that caters for a country's size and its technology needs, so that projects cannot be oversold. A total of 61 deals estimated at more than USD 40 billion will feature in 'Boardroom Sessions,' while another USD 28 billion will be showcased to investors at a marketplace Gallery Walk. The projects span energy, transport, agriculture, information and communications technology; water and sanitation, financial services, health, education, hospitality and tourism, housing and aviation. By bringing together multilateral financial institutions, pension funds, sovereign wealth funds and private investors, the African Development Bank aims to reduce market, political and financial risk, while making it easier to do business on the continent. Africa offers huge opportunities, especially in energy, roads, railways, ports, agriculture and minerals extraction. The African Legal Support Facility introduces competitive, flexible contractual processes to mitigate potential conflicts between the private sector and governments when negotiating deals. This includes ensuring project sustainability, risk reduction and the renegotiation of contracts to prevent their cancellation.